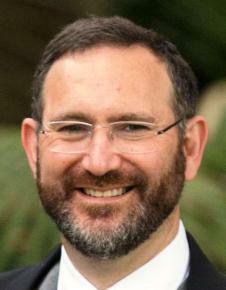 Rabbi Jeremy Lawrence is the Senior Rabbi at Finchley United Synagogue (Kinloss Gardens), London. He is the former Chief Minister of The Great Synagogue, Sydney. He is a former religious advisor to the Executive Council of Australian Jewry (ECAJ) and the New South Wales Jewish Board of Deputies (NSWJBD). He is a founder member of the NSW Jewish Arbitration and Mediation Service (JAMS). He is a qualified Disaster Relief Chaplain and also served as Honorary Chaplain to the NAJEX. Rabbi Lawrence was invited to give regular presentations to the NJW Supreme Court Judges Bible Study Group. He is active in Interfaith Dialogue at national and international levels. Rabbi Lawrence has an MA (Hons) in Jurisprudence from St Catherine’s College, Oxford University. Rabbi Lawrence qualified as a rabbi in Jerusalem attending Yeshivath Knesseth Beth Eliezer and Yeshivat Hamivtar on a Stanley Kalms Fellowship. He also graduated the Shaal & the Rothschild Foundation training courses for Diaspora rabbis. In Israel Rabbi Lawrence lectured in the adult education program of the NCSY Israel Centre. Rabbi Lawrence has a background in both informal and formal education. After university he served for three years as the National Executive Director of the Association of Jewish Sixth Formers. In this capacity he was a coordinator of the informal sixth form program at the Jewish Free School in London. Rabbi Lawrence was also a research assistant to Chief Rabbi Dr Jonathan Sacks for his 1990 Reith Lectures. After his semicha (rabbinic ordination), he served for two years as deputy head of Jewish Studies at Carmel College boarding school. Among his various activities in London he was on the Education Committee of the Board of Deputies of British Jews, led five study tours to Israel and in his student days was coordinator of the Oxford campaign for Soviet Jewry. He was also secretary of the Oxford University Criminology and Penology Society as well as a member of the Oxford Union. Rabbi Lawrence has wide-ranging interests from computers to environmental issues, magic, computer animation as well as Gilbert and Sullivan operettas. He is a keen media broadcaster with a Facebook and YouTube following. Rabbi Lawrence presented the Jewish welcome to Pope Benedict XVI when he visited Sydney for World Youth Day in 2008. · Modern Orthodoxy, Contradiction, Compromise or Conviction? Before arriving in Sydney, where he took over the Great Synagogue pulpit from Rabbi Raymond Apple, Rabbi Lawrence was Senior Rabbi of the Auckland Hebrew Congregation for seven years. He was a founder member of the Auckland Interfaith Council; he established the Kosher Kiwi Licensing Authority in New Zealand and has produced a wide range of publications and guides to Jewish life. He was a regular speaker at the annual CCJ and CCM inter-meetings. His role with the Auckland community has included close involvement with the Kadimah College School, liaison on a variety of issues with the New Zealand Government, interfaith work, public speaking and broadcasting. He is married to Mandy, who has a post-graduate qualification in health psychology. They have four children ranging in age from 6 to 21, Devora, Bracha, Shira and Rafi.